History of EUROPEA started in 1988, the year that saw the first reunion of the Green VET actors in Vire (FR), and the establishment of the Carrefour network. 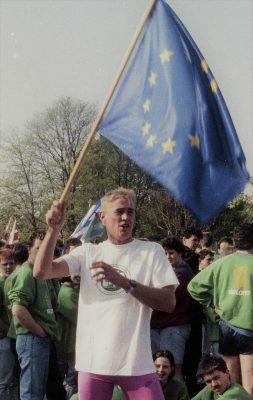 1989-1991 was a crucial period as well for it brought us the creation of EUROPEA and its committee of organisation (COE – Comité d’Organisation) with the task to set the “May 1992 in Strasbourg” event. Pic no1: Packed Main Square in Erstein! The idea of such a meeting was launched after the success of the “Grande Moisson“ in Paris, and the decision of the French Ministry of Agriculture to organise a spectacular gathering for students in Green VET and put together an agenda that would encourage cooperation in the fields of sport, culture and professional training. 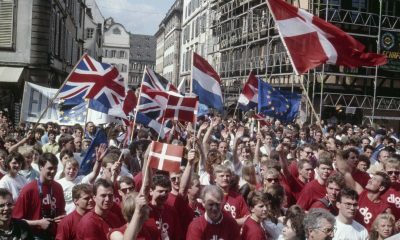 The project got on its way in Luxembourg on 16 October 1991 with the departure of the “European Relay”, a small object that was to be carried all around the continent symbolizing unity and belonging together. It travelled from country to country, from school to school by many different means of transport: bus, train, plane and sometimes it was even carried individually by runners just like in a real relay race. It finally arrived in Erstein, near Strasbourg (FR), on the very day of 7 May 1992 when already the first delegations from the participating Green VET colleges started to turn up for the big event. And during the next four days, from 7 to 10 May 1992, some 2000 (!) youngsters spent a quality time together completing a packed programme including professional workshops, round table discussions, exhibitions, concerts, parties and sporting events. Pic no2: Fons and the flag! “Names of my peers I can recall are Christiane, Carlo, Ginette, Dan, Gusti, Paul … We were the Pioneers of Green Knowledge (“Pionniers du Savoir Vert”), we took part in the preparations and we were together in Erstein. However, we owe a lot to our teachers who made it possible for us to get there: Norbert Feltgen (principal), Fernand Leesch (vice principal), Georges Krack (president of COE), Henri Kohnen, Jemp Steichen and Martine Hansen. During the 2015 EUROPEA Autumn Seminar in Luxembourg Georges and Fons were honoured by Mr. Fernand Etgen, Minister of Agriculture in Luxembourg for the long time they spent in European cooperation. Acknowledgements: many thanks to Fons (LU) for the interview he gave us during the FR/UK meeting in April 2018; and Georges (LU) for the valuable details. For more pictures visit our Facebook site.